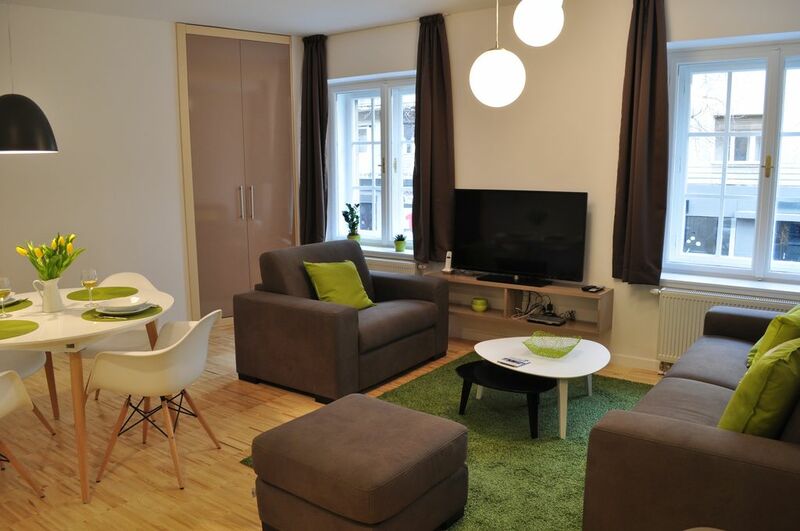 Apartments City & style are modern and completely newly refurbished apartments of 50 m2. Each consists of a living room with kitchen and dining area, bedroom, bathroom and a separate toilet. The apartments are air conditioned and free Wi-Fi is also available. The living room is equipped with a corner sofa which can be turned into a bed 160 cm width, LED TV 42" with the world's most popular channels and club tables. The open kitchen, as a part of the living room, is fully equipped with the latest elements: ceramic hob, oven, microwave, dishwasher, refrigerator with freezer, electric kettle and complete crockery and cutlery. In the kitchen is a dining area with modern table and chairs. The bathroom has a bathtub, sink and toilet, and there is also a separate toilet with sink. The bedrooms are comfortable with large (180x200 cm) double beds and a dresser. The equipment of the apartment also includes bed linen and towels. We hope You enjoy your stay in Zagreb, and if you will miss something we will be happy to try to provide. Nearby parking lot (150 m). Parking is not included in price (cca 10 Euro/day). Nice, clean apartment with a large shower. Comfortable apartment just a 5 minute walk to the old town with convenient, inexpensive, parking available close by.